On one level it could seem simple. Pesticides have to be used (even in Organic) otherwise the yield of farming would be too low and the land, water, energy and labor invested in a crop would be compromised or lost. Not all pesticides are the same (They actually differ rather dramatically in terms of their particular risk factors or lack therof. All meet rigorous EPA-determined risk standards when used according to the detailed EPA label limitations, but that still does not mean they are the same). So, the answer might seem simple. Just pick the option with the least risk and you will be the most sustainable, right? From the perspective of an environmental organization, the key risk factors are for humans (workers, consumers) and for the environment (birds, bees, fish, earthworms…). Unfortunately, the problem is that it isn’t that simple. When you get into the details of what it takes to grow each particular specialty crop there are a whole lot of other risks (and benefits) that have to be considered in the decision of whether to use a pesticide and which one. I’d like to give just a few specific examples of where sustainability depends on pesticides in unexpected ways. There is a moth called the Navel Orange Worm (NOW) that attacks tree nut crops. The larvae eat their way into the developing nut while it is still in its green husk. If a grower was only concerned about yield of nuts, not many insecticide sprays would be needed to produce an economically viable crop. Unfortunately, these larvae not only injure the nut, they tend to inoculate it with the spores of a fungus called Aspergillus flavus. That fungus then produces a toxin called aflatoxin which is the most potent natural carcinogen known. As I’ve said in a previous blog, the food system in the developed world does a remarkable job keeping this terrible toxin out of the human food supply. In the developing world this is one of the most frequent causes of death (liver cancer, immune-suppression). 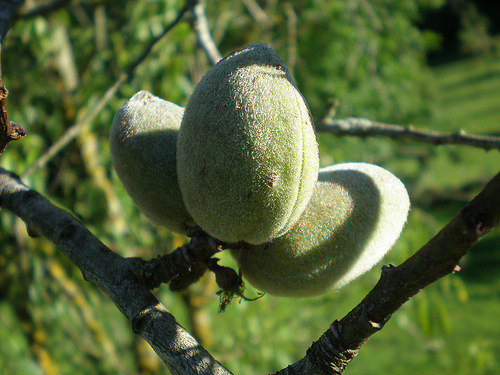 In the case of tree nuts, prevention of aflatoxin contamination is accomplished by applying more pesticide sprays than would be needed just for yield protection. The growers are also using other cultural and IPM methods, but this is definitely a case where using fewer or lower risk pesticides would NOT be the right “metric”. We need the growers to continue to use what works to protect us. When I started graduate school in an agricultural field in 1977, Integrated Pest Management (IPM) was a brand new field. Since that time it has gone a long way towards helping growers successfully grow their crops with minimum possible risk to the environment and us. One of the particularly cool methods that is used is called “pheromone mating disruption.” Many male insects find their mates by following the “scent” of the pheromone chemicals that the females produce. One important IPM strategy is to put up a bunch of sources of the same pheromone chemicals throughout something like an apple orchard so that the males can’t find any real gradients leading to a female, and so little mating occurs because of this “disruption”. Little mating, fewer pests in the next generation. This method works great as long as the overall population of the pest in a given area is quite low. I will follow-up with additional crop-specific cases where pesticide use decisions (and sustainability assessments) get complicated. More industrial farming propaganda? At least you didn’t try and tell us pesticides are benign, like you did first time. You posted pesticide advertisements on this blog. Then you will probably not like my next post which will be about the issues with the main fungicide used in Organic. I wouldn’t say this was an advertisement as much as a defense. The idea that there is a “no risk” option is simply a delusion. All options involve hazard and it all comes down to how you handle it. Electricity is an extremely hazardous thing, but we have ways that we manage the associated risk so that we can have the benefits. I’m sure as a partner at “a leading agri-business consulting firm” you have all sorts of strange opinions on why pesticides aren’t poisonous. However, the least you could do is not spam your commentors with unsolicited bulk emails from your work e-mail address. Thanks for the note letting me know you are back in the saddle! The rant about the ‘bulk mail’ is a laugher! Trying to educate people like Gregg (who seems to be a ‘true green’) is not possible. They already ‘know’ and have no need for further information. This seems to be true for virtually anyone with a strong bias toward either extreme. The good news is that those people (the extremes – both for and against most anything) seem to be a very small percentage of the population. The so called silent majority is the part of the population that really counts. The bad news is that the extremes are more vocal and try to convince the majority that their opinion is the only one that counts. You (and others) have previously published how small a percentage of the food supply is organic. İf we want to eat we need to be aggressive in pest control. What really strikes me as silly and sad is the apparent position of the true greens that the poor of the world should just go ahead and die off so they can have their perfect world. The poor are the segment of the population most seriously affected by the anti pesticide and anti GMO crowds propaganda and actions. I gave up the assumption that the “organic” label was inalienable and ideal a long time ago. The book ~Just Food~ changed a lot of my thinking on what it means for a food to be “organic.” I still buy organic food, but I don’t assume it’s always the safest or most sustainable option. Glad to see you are still following this blog and contributing! I agree about Organic. Since it is based on the intuitive idea that “natural” is better, it really does not have the ability to adjust when that turns out not to be the case. The idea that it is such are superior and pure system really just comes from highly successful marketing. 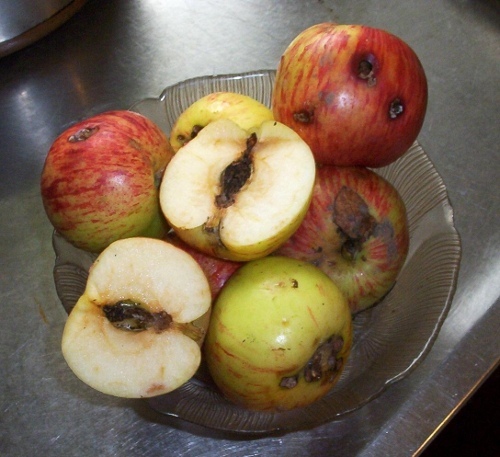 Organic apples from Washington State are possible in some large part because of the aggressive control of “hot spots” by conventional growers. Many experts in that area have told me that they don’t think the total percent of Organic could get too high (maybe 10%) before the whole industry would be at risk. I think the real answer is that there is no one answer (nor should there ever be). Just as nature protects itself as a whole by diversifying, I believe we should keep our agricultural methods as diverse as is possible while still feeding everyone (for the exact same reason it works in nature). Not because any one system is necessarily the best, but because it ‘hedges’ our bets against unforeseen disasters. Of course, that isn’t what a business analyst is going to want to hear because diversifying cuts down on the bottom line in the short term. It also isn’t exactly what you are describing (and I’m no expert) but your ideas do seem closer to my ‘Ideal’ that most others I’ve heard. The danger I worry about has more to do with herbicides. By genetically splicing the same genes into almost all of our staple foods, doesn’t that make us MUCH more susceptible to catastrophe? Even if there is a problem with some of these pesticides most of us clean, skin, and look at nearly everything we eat so I can only imagine that we are mostly safe from even dangerous pesticides. If some virus or bacteria was to develop which was able to take advantage of the same properties that the shared genes on most genetically modified foods give them, it could theoretically lead to mass starvation unlike the world has ever seen. Even if we stopped using those genetically modified seeds we would still be in trouble because we would then not be able to nearly fulfill the same needs as we were previously able to. I’m not calling for a ban on herbicides but I think I would support a ban on long term trademarks (more than 10 years or so) for genetically modified foods. I know it is a little off topic and I really don’t know that much about these topics but to me it just seems like common sense to avoid a ‘one size fits all’ approach here. Greg – Where are you from, because you have no idea what your talking about lol! And can you explain what you mean when you say “Industrial Farming” because it seems that people are now using it synonymously with conventional farming and there is a HUGE difference between a mega dairy farm and say a conventional apple grower. You might be using it because it is a buzzword, but don’t think your using it in the right context. I fear that anything conventional (even fresh produce) is now being vilified and mistakenly being lumped into the GMO, dairy, corn, and soy industry (or industrial ag that sends is crop to processors) category when they are really worlds apart. The net result is that consumers are getting confused and could possibly be scared away from fresh produce altogether. its great to see that someone actually understands that farmers need to use pesticides to remain sustainable. im so tired of hearing all the nonsense discouraging the consumption of the crops that have been sprayed with pesticides. 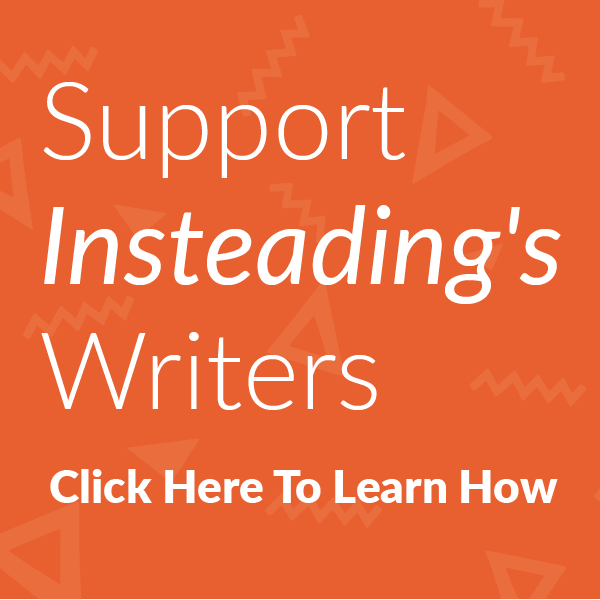 Pingback:Going Beyond Industrial vs. Alternative Ag. : Eat. Drink. Better. Pingback:The “Pesticide From Hell” (oh, by the the way, its “Organic”) : Eat. Drink. Better. Pingback:Pesticides That Buy Time : Eat. Drink. Better. Pingback:Where Have All The Nasty Pesticides Gone? : Eat. Drink. Better.